Terres Basses in St. Martin is known for fine beaches and great scenery, and La Magnolia Villa is situated to enjoy these. The home overlooks the ocean, so the water views can be easily enjoyed from the large patio outside, and the beach is a just a short drive away for swimming and snorkeling. There are 3 bedrooms and 3 bathrooms, and La Magnolia is great for couples, friends, or families. Outdoor living is easy here with a bar, dining area, and lounging area on the terrace. The pool is nearby for cooling off on hot days. There’s also a full kitchen inside as well as a comfortable living area. Groceries and restaurants are a short 10 minutes away. 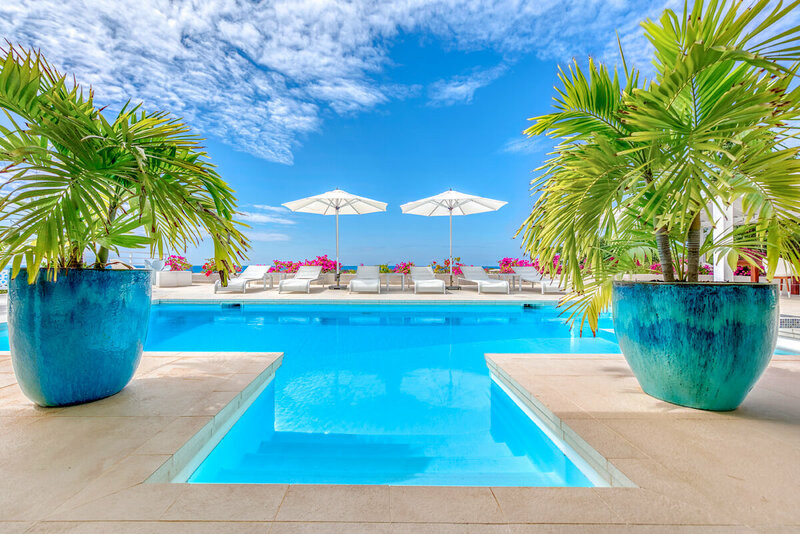 La Magnolia is a gated property located within the community of Terres Basses, lying on the ridge of a gentle hill, surrounded by tropical gardens and allowing spectacular views south west over the Caribbean Sea and the Island of Saba. Long Bay Beach, one of the finest white sand beaches of the island, is a stone throw away, as is La Samanna Resort famous for regularly hosting international celebrities that share the same beautiful beach of Long Bay or “Baie Longue”. The outdoor living space at La Magnolia includes a large sunny deck with lounge chairs, a covered terrace equipped with a bar and refrigerator, a dining area for 6 guests with a gas BBQ grill, as well as a lounge/seating area. The property enjoys excellent privacy with no neighbor to overlook the premises. All three air-conditioned bedrooms at Villa La Magnolia are furnished and decorated with style and attention to details. The Master bedroom and the two guest bedrooms feature their own TV set. Each bedroom has direct access to the terrace and the pool and allows a beautiful view of the pool deck and the Caribbean Sea beyond. You will find some of the best restaurants offering a perfect blend of French and local cuisine within a ten minute drive. Grand Case, food capital of the Caribbean, is only twenty minutes away. La Magnolia is an excellent choice for 2 or 3 couples traveling together, or for a family of 4 to 6 members seeking a peaceful, quiet, secured, well maintained rental property to enjoy a relaxing Caribbean vacation. The villa offers plenty of space and the comfort of a home away from home, and even better! Bedroom 3: Main Level - Connected to Bedroom 2 through the dressing room doors.